Drift along the Chunnambar backwaters on a houseboat, but do make time for the beach. NAVIGATE through the Chunnambar backwaters flanked by coconut trees, towards soft sands and find a welcoming sign that says a�?Paradise Islanda�� where you can anchor for the night. 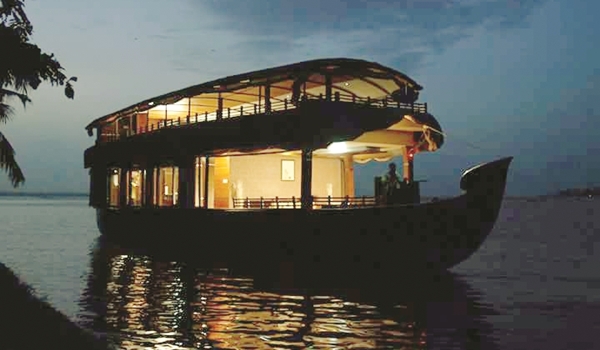 This is an experience offered to Pondy visitors, starting this weekend, courtesy a spanking newA� Kerala-style houseboat. Paradise Beach retains an aura of seclusion, as it is usually accessible only by a boat from the mainland. With the launch of this new experience by Mantra Houseboats,A� Pondicherrya��s backwaters now remind one of the iconic holiday experiencesA� in Alappuzha. Built with bamboo and teak, the huge floor-to-roof windows lining the corridor and the bedrooms provide stunning vistas of the Ariankuppam bridge, the Chunnambar boathouse fleet and glimpses of Paradise Island. The double-decker houseboat, which is equipped with a kitchen, has three air-conditioned bedrooms fitted with mounted fans, furniture and closets. The closed deck behind the drivera��s seat has benches which are perfect if you want to float along in tranquility. This space also doubles up as a dining area and entertainment centre, where travellers can catch something on TV or choose from a selection of movies. The upper tier has been designed for parties, get-togethers and conferences (maximum 50 people); but its open deck on the roof is just the right spot to quietly watch the sunrise or sunset. Though you can spend 24 hours onboard, the actual hours of boating are minimal. Guests are welcomed with a drink at 11 am, followed by a slow cruise to Paradise Island. Lunch and other meals a�� predominantly South Indian, with dishes like idiyappam and egg curry, biryani and Chettinad chicken curry a�� are prepared onboard. Guests can rest on the boat or enjoy time off on their own at Paradise Beach till 6 pm, followed by more boating. a�?The houseboat will tour the entire stretch of backwaters, including the narrow but more scenic stretch along the far end of the beach. Tourists normally dona��t get to experience this,a�? says R Anu, CEO, Mantra. Spa and massages onboard, and a bit of fishing practice for guests may be introduced shortly. The boat anchors at a jetty near the beach at 7 pm and guests are dropped off on the mainland after breakfast, by 10 am the next day. Life jackets, life buoys and fire extinguishers are on board to ensure safety.